Ideally, state-of-the-art chiropractic care is about precision. Large, forceful spinal adjustments are neither necessary nor desirable in a great many cases. If you know you need a chiropractor but hesitate to get help due to the thought of such adjustments, you’ll be delighted to know that our team at Midwest Chiropractic Center uses the cutting-edge Impulse Adjusting Instrument to make fine, pain-free adjustments. 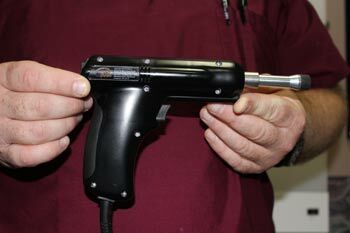 How does a little hand-held tool that looks like an ordinary home improvement implement make chiropractic adjustments? To understand this, you must first understand that even the tiniest misalignments in the spinal column can produce a large amount of pain and functional limitation. You don’t have to suffer a major cervical dislocation in an auto accident, for instance, to suffer from severe headaches, neck stiffness, arm pain, and other classic symptoms of a cervical spinal misalignment. A slight pressure against a sensitive nerve can cause that nerve to malfunction, causing pain, numbness, muscle weakness, and even systemic dysfunctions such as poor immune response. Just as modern laparoscopic surgery uses the smallest possible incision to do its work, the Impulse Adjusting Instrument allows chiropractors to make the smallest possible manipulations and still get the maximum positive results. The FDA-registered Impulse Adjusting Instrument works by applying small, targeted amounts of force — its lowest setting feels like nothing more than a tapping sensation — at point-blank range on the exact part of the musculoskeletal system that needs adjusting. After placing the instrument against the skin, we deliver a series of gentle, painless pulses that shift the joints just enough to relieve nerve pressure, or to correct a small misalignment that’s causing serious balance problems. The sophisticated microcircuitry within the device lets us program it at different strength levels while ensuring the amount of force delivered remains uniform. If you’re experiencing pains, spasms, or inflammation as part of the condition being treated, then you may not notice immediate relief — but many patients feel significantly soothed by the procedure. The Impulse Adjusting Instrument is so gentle and subtle in its work that the body permits it without clenching up or resisting, a reaction that sometimes makes traditional chiropractic manipulation more difficult. The lack of muscular resistance not only allows the procedure to be more effective, but it also allows it to work faster. In fact, the impulse Adjusting Instrument can perform an adjustment up to a hundred times more quickly and efficiently than a standard manual adjustment. The various pressure settings on the Impulse Adjusting Instrument enable us to use on many different parts of the body and for various types of problems. But all three settings are delivered at a frequency that naturally resonates with body tissues, producing powerful results with minimal effort. If that sounds like the kind of care you’d like to receive, contact Midwest Chiropractic Center to learn more about our Impulse Adjusting Instrument!